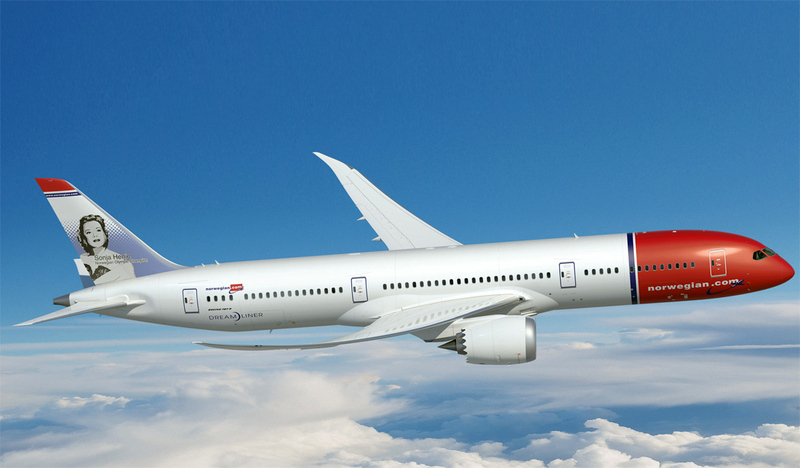 Norwegian’s website operates effectively and is an easy first source for an excellent variety of fares available, with clear details of what is included in each fare. Customers may also add on extras such as meals, checked-in luggage and seat reservations at this point. Norwegian views these as all optional extras which is beneficial for customers who wish to have the stripped back flight experience. Norwegian departs from New York’s principal airport JFK on flights to London. The airport has good connections with downtown New York, taking around an hour by public transport ($7.50) or 30-50 minutes by rideshare / private transport (from $25.00), traffic dependent. The airline does operate from secondary airport Stewart International although this is some way from downtown New York. Norwegian operates from Terminal 1. 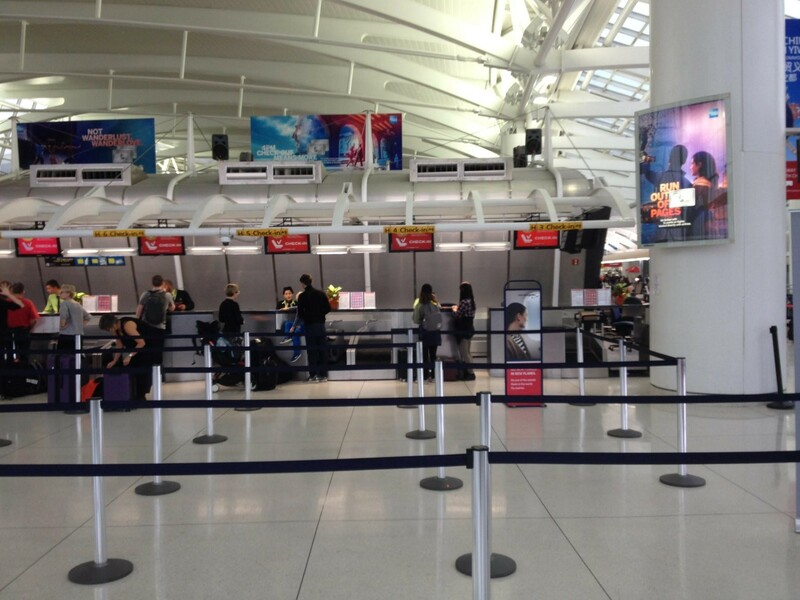 Check-in counters are clearly located within the terminal building, and there is clear signage for standard and premium customers. 1 hour 50 minutes before the flight there are no queues, with many counters open and staff calling over customers. Check-in service is very quick with no seat assignment preferences offered (this can be preselected for a fee, but changed for free at the airport). There are self-check-in machines within the area and I use one of these to easily change my seat assignment – this has the added advantage of showing the seat map and quiet areas of the cabin. Customers must still attend check-in to gain a stamp on their boarding pass prior to proceeding to customs and immigration. Queues are heavy at security and TSA shout at customers in their usual terse way. Of note is a K9 sniffer dog check which removes the need for customers to remove liquids / laptops / shoes prior to screening. Facilities and seating at Terminal 1 are very limited and the terminal is quite dated. Food and beverage is priced highly, with a double espresso costing $4.90 as a sample. Norwegian has a large space designated to boarding, and this commences on time with an announcement for Premium customers and those requiring extra time / families to board. Signage for queues was clear and queue was orderly, although is processed slowly. Boarding by zones is indicated by not adhered to or checked by staff. Operating DY7014 is Norwegian’s largest, most efficient and cutting-edge aircraft, the Boeing 787-9. 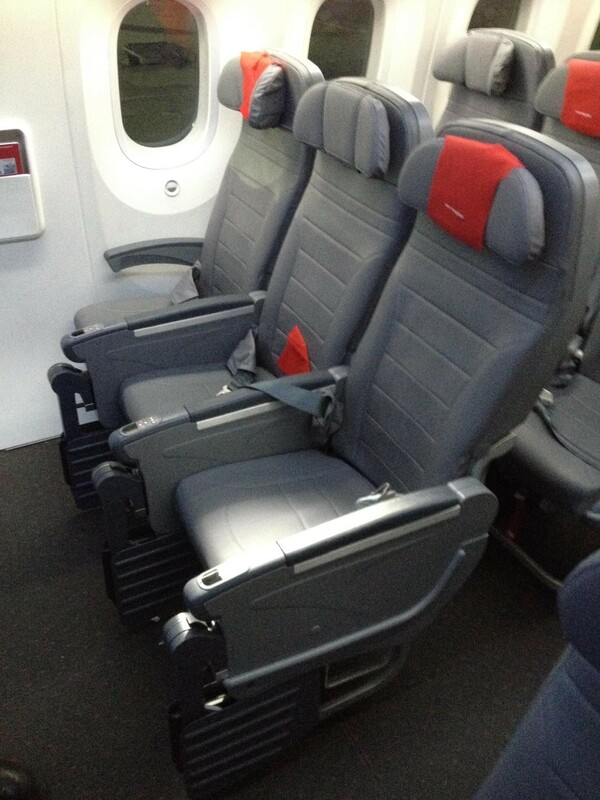 The aircraft seats 314 customers and there are 9 of these within the fleet, along with 8 787-8 subtypes. The passenger load is around 95% full this afternoon. Customers are entitled to 10kg of hand luggage, which is carefully confirmed at check-in and will include any laptop bags / purses. On the occasion, I am permitted with 10.7kg of weight. Beyond this, customers must pre-purchase checked-in bags via the website, or for an inflated fee at the airport. The matrix for finding out the cost of pre-booked baggage is quite confusing as it differs between city pairs, but should be 32GBP between JFK/LGW, whilst the savings made are not substantial compared to doing this at the airport (a flat 40GBP fee for all flights). 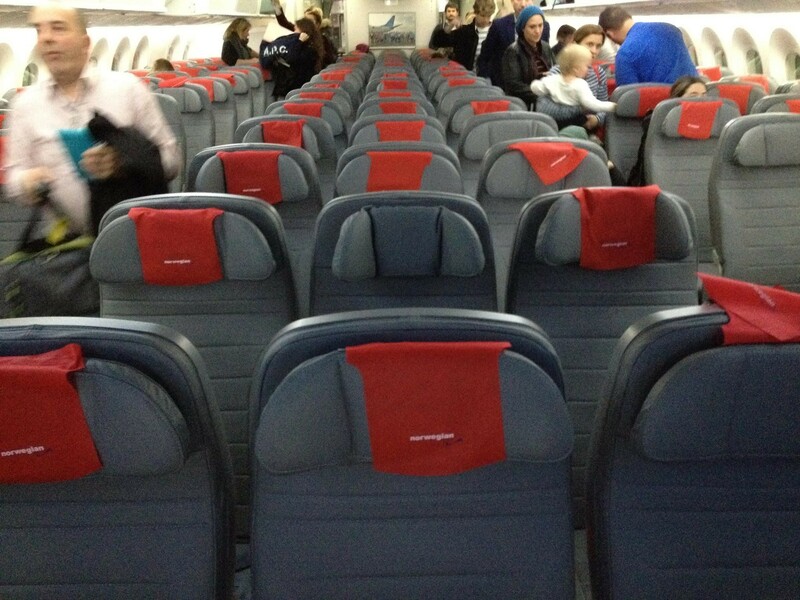 Seating is arranged as 3-3-3 which is standard for most operators of the 787-9. The seat itself is grey leather with a red micro-fibre headrest. There is no advertising in any areas of the cabin / prior to entertainment screenings which is refreshing and adds appeal to the onboard atmosphere. The legroom is around 29”, so tighter than most legacy carriers but not uncomfortable given my healthy height. Tray-table deploys easily and adjusts forward. All seats have personal TV screen. The recline of the seat is modest but there is good adjustment in the headrest with stiff flaps to keep lolling heads steady. When boarding is completed, a video display introduced the aircraft and its features. This is an informative video and very useful for customers. It covers; location of washrooms (emphasising that the forward 2 washrooms are for premium customers), details of reading light / call bell location on the entertainment system, location of electric outlets and USB charging sockets (USB in each PTV screen, universal outlets below the seat), the Snack Bar function and finally some of the more subtle features of the 787 (including air quality systems and dimmable windows). The cabin is clean and neutral in appearance with appealing mood lighting effectively used throughout. Windows are automatically dimmed to a medium brightness once the seatbelt sign is turned off and can be further adjusted individually by customers to ‘black out’ setting. The cabin is decorated by UNICEF themed pictures at the bulkheads and screens indicate moving maps / flight details throughout. The aircraft boards on time, pushes back early and thanks to forgiving air traffic at JFK, takes off only 3 minutes behind its scheduled departure on this rainy afternoon. Pre-ordered hot meals are available via the website. These cannot be ordered whilst onboard. The onboard offering is provided via the PTV system on an ordering service system, branded Snack Bar. This provided quite a revolutionary system of ordering and paying for buy on board items, effectively making the old trolley-based service obsolete. The visuals of the system are excellent and clear too, and navigation is easy between the three categories – Drinks, Snacks, Amenities. The overall selection is quite fair, although perhaps is not as enticing as easyJet’s food offerings – these feature antipasti and meal deals for example. All items are listed in USD and payable only by Mastercard / Visa / AmEx which consumers should be aware given most non-US cards charge a service fee per transaction. However, the checkout and payment system appears to work with ease. Customers add various items to a basket and can review their order prior to proceeding to payment. 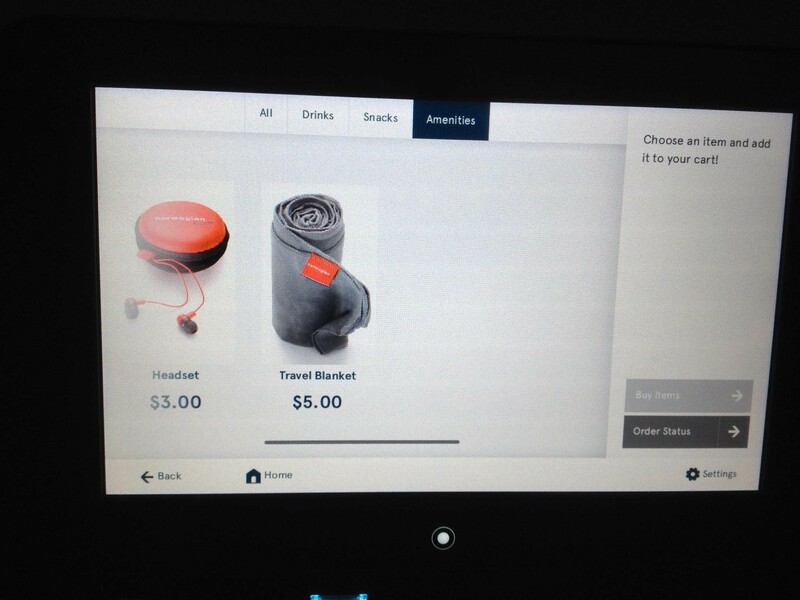 There is a choice to also ‘start a tab’ if customers continue to make small purchases throughout the flight. The technology at work here is superb. Orders are normally delivered to customer’s seats in less than 2 minutes. Pricing for snacks and beverages are in-line and at times less than other LCCs. 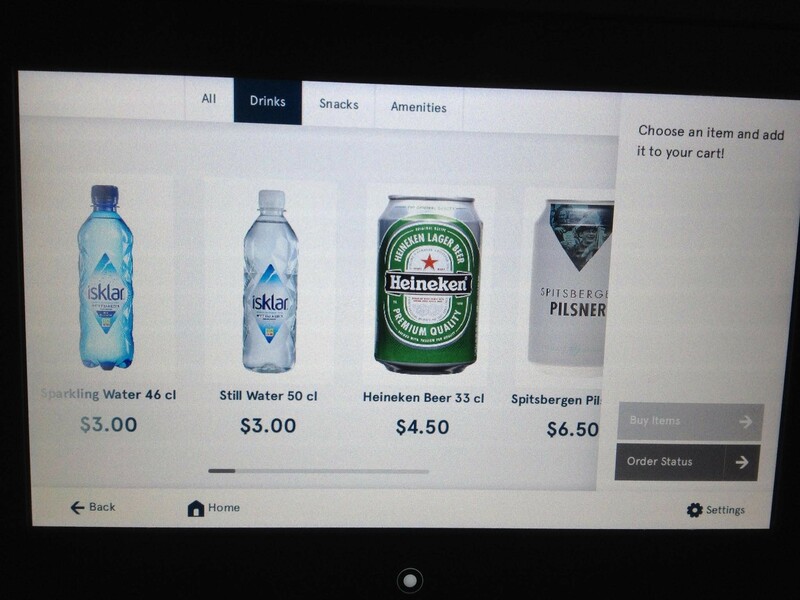 For example, a Heineken beer is $4.50 compared to Ryanair which charges $6.00. Four sandwich options (two may be heated) and various other snacks and nibbles are offered. Sandwiches are 7USD, and crisps / sweets are 3USD. Water is priced at 3USD for 500ml and free drinking water may be requested. Around 3 hours into the flight, all sandwich options are shown as sold out. My pre-ordered hot meal is served 70 minutes after take-off. 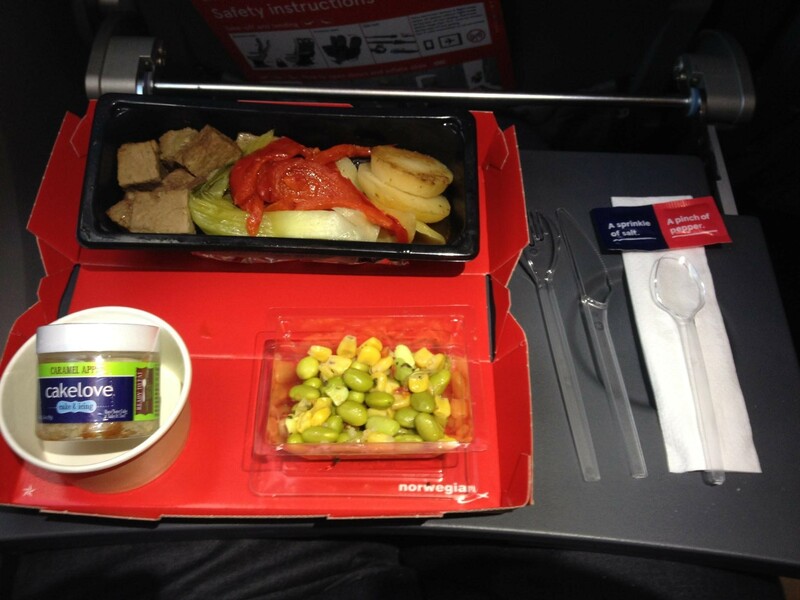 The cardboard tray and plastic cutlery are quite basic, but the tray looks simple and is neatly laid out. The appetiser is a corn and edamame bean salad which had a strong vinegary flavour and was unappealing. The entrée choice is between chicken rice oR beef. There is not much more information given. It is very disappointing and plain – no sauce with the dish and it is in a watery juice. The meat lacked flavour but was tender. Drinks (beer, wine and juices) are offered after 20 minutes, and a further 15 minutes later coffee and trays are cleared. The dessert is a potted toffee apple desert and was very delicious. Overall the savoury options were disappointing. A snack is served 90 minutes prior to arrival as a packed lunch format. This included a wrap, juice and a cinnamon bun, with a coffee and water run conducted. Quality was quite average, and wrap was quite tasteless and unappealing. Volume and appealing of entertainment is excellent. Each seat is equipped with a personal LED TV, around 8”. This features an excellent inflight map (lots of different views / information on destinations available via this). There are games available, order-at-seat duty free (limited selection), movies, TV shows and documentaries. There is an excellent ‘For the Kids’ section which features a child-friendly map, games and selected videos for kids. There is ample selection of movies available, including some of the most up to date titles and classics. There are 41 movie titles, and these include high quality productions / latest releases. Some boxset TV shows were also available. Headphones must be purchases via the on-screen shop, although personal headphones are compatible with the system. A blanket ($5 USD) may be ordered through the PTV system, although the temperature onboard was pleasant throughout. No cushions or overnight kits available. This was best described as business friendly. Crew members were polite and welcome customers onboard and assist with luggage placement. The crew are quite efficient with their services, but were somewhat dismissive when customers asked for items and would flatly point them towards their screen. Some customers are probably not familiar with this newer system, so assistance and more patience would have been used here. The crew were quite professional, and pay attention to safety procedures very well. Arrival into LGW was on time, although the gate is quite a walk from immigration. Baggage retrieval takes quite long and there is a wait of 15 minutes on top of the walking time. Little in the way of ground personnel visible and limited same-day connectivity with this flight although desks were noted. Norwegian are truly a disruptive force, taking root in the backyards of many European legacy carriers and making long haul low cost travel something more of a reality whilst underpinning this with what is a high-quality, modern product. At all points the balance between low cost carrier and a comfortable / convenient airline is struck effectively – for example the wide library of free to access films. Areas for improvement would be the quality of the pre-order hot meal, the availability of sandwiches onboard and in some areas, staff approachability. Ground services and their new Boeing 787-9 product stand-out. The system is convenient, informative and full of content, making a 7-hour sector fly by with ease and appeal.